I like watching of romantic movies. During free time I would read novels or short love stories. One of my favourites are stories that talks about long distance relationship. It was in 2010 when I met my ex-boyfriend now husband through a blogger's event. Our friendship became more stronger through chat and emails because he was in Taiwan then for his teaching job. I can remember how many times he said 'Maghihintay Ako' because I was not ready yet for another relationship. 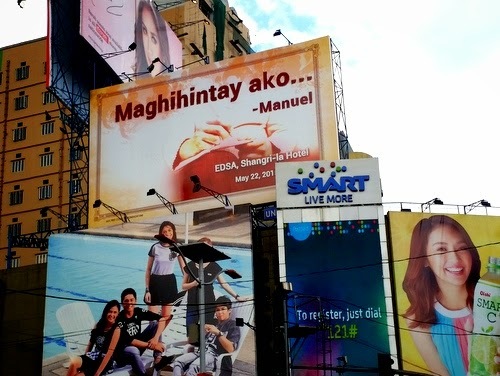 Just last weekend, after our budget shopping in Divisoria we passed by Recto, Manila and found this billboard with a Filipino love notes "Maghihintay Ako... - Manuel". Although it sounds a bit corny, like what I said it reminds me of romance stories and teleserye. 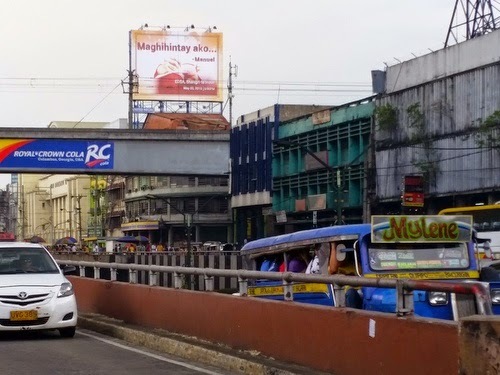 When we reached Morayta area (a familiar place where I usually go to renew my PRC license) we saw another billboard with the same message "Maghihintay Ako - Manuel". Now, I'm starting to think about Manuel. What do you think of this signage? Who is Manuel? Who or what is he waiting for? Is he talking about love, relationship? I have a feeling it's about long distance relationship. He's probably waiting for the love of his life who's an OFW. Yeehay! Kilig much just like most stories on pocketbooks. There's an additional text "EDSA, Shangri La Hotel, May 22, 2015". I have a strong feeling, a wedding proposal will happen on May 22 at EDSA Shangri La. How about you? What are your thoughts about Manuel? Deadline of comments is on Monday. I will choose one best comment on Tuesday. I want to see this! Im excited on May 22!!! HHmmmm? #MaghihintayAkoManuel??? I have yet to see the billboard but this is so intriguing? saw this while driving. cheese sya ha... Ano ba ito nakaka intriga ha!! !